I'm collecting the mystery club coins. Just found out that there are "Save this coin" and "Save this medal" variations. Any advice on completing a set? Welcome to the CJCA forum boards! The Cracker Jack Presidential Coins and Metals are popular with CJ prize collectors as well as coin and political item collectors. The Cracker Jack Mystery Club was started in May of 1933, offering persons who joined first with ten President coins found in boxes of Cracker Jack or Checkers, dropping the number to join to three then increasing the number to five coins later. There are 31 presidents in the set from the first president, George Washington to newly elected, at the time 32nd president, Franklin D. Roosevelt. Grover Cleveland's coin has his two non-consecutive terms 22nd and 24th, hence 31 coins instead of 32 coins. The Cracker Jack Mystery Club sent back to a member who joined a membership certificate and a little gift. Also sent back to the new member was the number of coins or medals sent in with Canceled stamped on the back of the coin or medal. Note: There are only TEN President coins that have the word CANCELED stamped on the back. These stamped CANCELED coins are harder to locate than the regular coins or medals. The Cracker Jack presidential medals were issued toward the end of the production so they are harder to locate than their coin variety types. In May 1934 The Cracker Jack Company discontinued the distribution of the presidential medals and started inserting picture cards of Movie and Radio Stars in the Cracker Jack Mystery Club boxes. Cracker Jack Collectors, such as those from CJCA, as well as coin collectors who collect exonumia would have these coins and medals. Also presidential item collectors may have some for sale. On line auction such as eBay are excellent places to look for these fun Cracker Jack prizes, good luck! These coins sound very cool. Are they engraved on both sides? If anyone would like to post pictures I' love to see them. Here are samples of each type of the Cracker Jack Presidential coin, medal or canceled coin. Each row is the obverse and reverse, top row- coin, middle row-medal and bottom row-canceled coin! Last edited by CJAAAJ on Sat Jun 06, 2009 3:58 pm, edited 1 time in total. I have one "Save this Medal" and one Cancelled (Abraham Lincoln). I found one in an Antique Mall for $1, but most of the "Save this Coin" go for $6 - $12 on ebay. It's always a great day when you find a nice CJ prize at an antique store for a buck. Another "interesting" aspect of these coins is that they were punched out by the thousands and as they did, the dies worn and were eventually replaced leading to variations of the same coin. I believe the coins were stamped using a 2-part die consisting of an outer ring die and the inner ring. 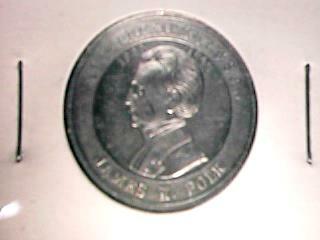 I have variations of most coins, here is an example of the james K Polk one. 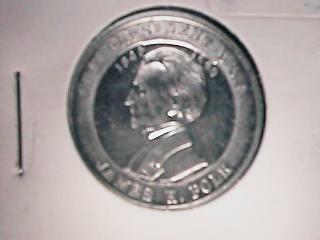 In the first coin, the dates are well separated from the head. 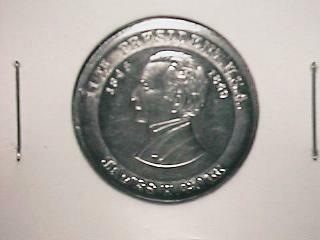 The third coin has the "18" of 1845 aligning with the "P" of PRESIDENT. In the 2nd coin, the "84" align with the "P". There are other differences, but these are ones which are easier to find on the photos. Do you know which 10 presidents were cancelled? Yes, the 10 canceled Cracker Jack Presidential Coins are: 1.#1-George Washington, 2.#2-John Adams, 3.#3-Thomas Jefferson, 4.#7-Andrew Jackson, 5.#16- Abraham Lincoln, 6.#18- Ulysses S. Grant, 7.#22 and #24-Grover Cleveland, 8.#26-Theodore Roosevelt, 9.#28-Woodrow Wilson, 10.#32-Franklin D. Roosevelt. 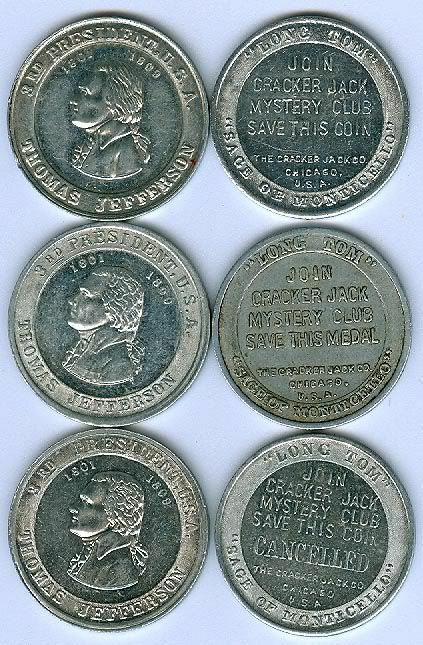 These CJ Presidential Coins were returned to the new member of the Cracker Jack Mystery Club canceled, first all ten, then three and later five coins. 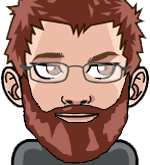 Ginger asked about cancelled coins, so I'm going to post this so it will show up under new postings since I'm not sure how to direct her to this site!